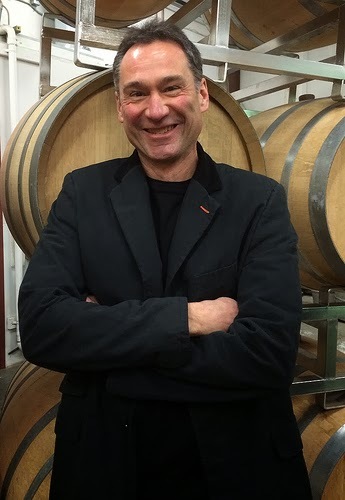 Ben Smith, one of Washington state’s finest wine makers, keeps a pretty low profile. You don’t get many chances to visit with Ben at his Cadence winery in South Seattle. So, when Ben hosts an open house you need to take advantage of the opportunity. Cadence was open for a holiday open house on a recent December Saturday afternoon. Ben had his current 2010 releases open for tasting as well as two wines from his first commercial vintage – 1998. This was a perfect opportunity to take a bit of time to talk with Ben and reflect on his wine making journey as well as explore how some of his creations have aged. The 1998 Tapteil red is a fine example of that Red Mountain magic. This wine is 15 years old and represents Ben’s first commercial vintage. It is still showing plenty of the power you would expect from a Red Mountain wine. This wine is dark and bold with loads of currant and black cherry with some light pepper notes. The finish features classic dry dusty tannin along with cocoa powder and coffee bean tinged spices. 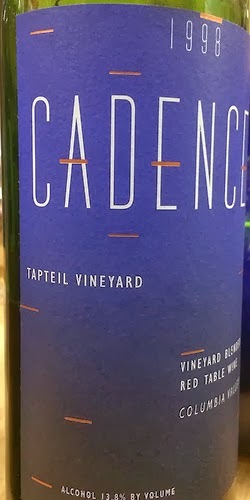 In addition to Tapteil, Cadence also offers a Ciel du Cheval vineyard designate red blend. I was curious to learn why Ben had chosen these vineyards and how he manages his vineyard designate wines. Tapteil and Ciel du Cheval are two vineyards very close to Ben’s heart. He started experimenting with both vineyards as a home winemaker.By creating vineyard designate blends he was able to get his foot in the door with these two “in demand” vineyards. 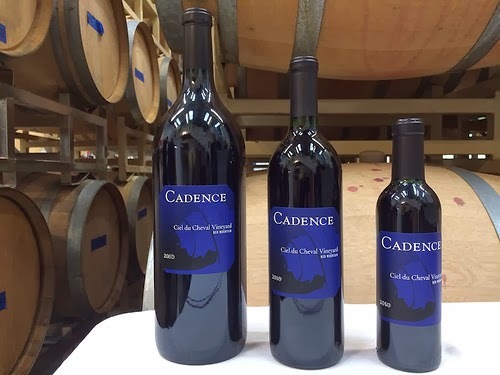 As it turns out, Cadence became the first winery to make Bordeaux style blends as vineyard designated wines in Washington. Completing Ben’s Red Mountain triumvirate is Cara Mia, Ben’s estate vineyard. The vineyard was planted in 2004, with the first harvest in 2006. The vineyard is planted to 40% Cabernet Franc, 30% Cabernet Sauvignon, 20% Merlot and 10% Petit Verdot.Cabernet Franc is one of Ben’s favorite grapes due to the complex and interesting aromas as well as lovely textures. With all three vineyards Ben goes for a profile that he believes best represents the site. Ben described the dominant characteristic of each vineyard in the following manner. Tapteil was a no-brainer. According to Ben it screams Cabernet Sauvignon. Ciel du Cheval was a little more difficult to figure out. For his Ciel du Cheval blend Ben focuses on Cabernet Franc. Finally, the Cara Mia estate vineyard features two blends. These were the most challenging to determine. You can imagine why. Learning the profile of the vineyard was not possible until the vines began to yield fruit. The Bel Canto blend is focused on Cabernet Franc while the Camerata is primarily Cabernet Sauvignon. Ben works to keep his four wines consistent with the intended character from one vintage to the next. At the same time he appreciates the variation that each vintage has to offer and works to capture the vintage’s uniqueness while staying true to each wine’s style. He recognizes the tension this introduces to his wine making. Just like a vine struggling to produce high quality fruit, the tension in Ben’s wine making process leads to some fantastic results. just recognized the opportunity to learn and get better. Over the years Ben continues to work with adjustments such as refining pick dates, changing the trellising system at the Cara Mia vineyard (three times! ), vineyard yields and experimenting with yeasts. Ben’s drive for improvement is reinforced by his attitude that “I don’t keep doing things the same way just because that is the way I have always done it." I must say that Ben is conducting a highly delicious, and successful, experiment at Cadence! Ciel du Cheval : Medium bodied with logan berries and currants blending with hints of mint and cedar spices. The finish is bold and dry with great tannin spices. Tapteil: Darker with savory notes and some floral top notes rounding out with some earthy spices and light smokiness. The tannin show through on the finish here too with spicy dry cocoa powder notes. Camerata: Spicy and savory with dark cherry and clove spices that are followed by a dry tannin fueled spiced finish. Bel Canto: Earthy mix of cranberry and currants followed by dry spices, heather and cloves that give way to a dry cocoa and coffee bean on the finish. 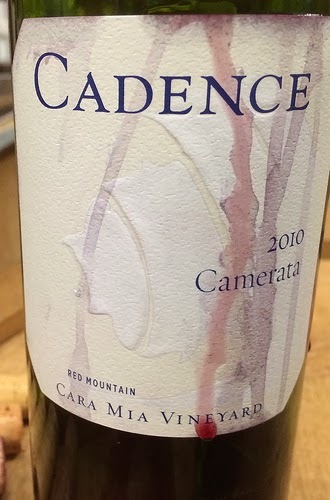 All the 2010 Cadence wines are tasting great right now and will continue to get better with age. The “odd man out.” The 1998 Spring Valley Red Blend is from Walla Walla. Don’t overlook this one! The Spring Valley vineyard is located about 10 miles North of Walla Walla. It is interesting to note the subtlety of this wine. I always associate Walla Walla wines with power (with a capital ‘P’). Whether it is the 15 years of age, the location of the vineyard, Ben’s winemaking style or all three, this wine is tasting great too. The Spring Valley shows red berries, pine needles, forest floor and leather followed by a savory, tart finish that features notes of white pepper.